Prepare cake batter according to package instructions. 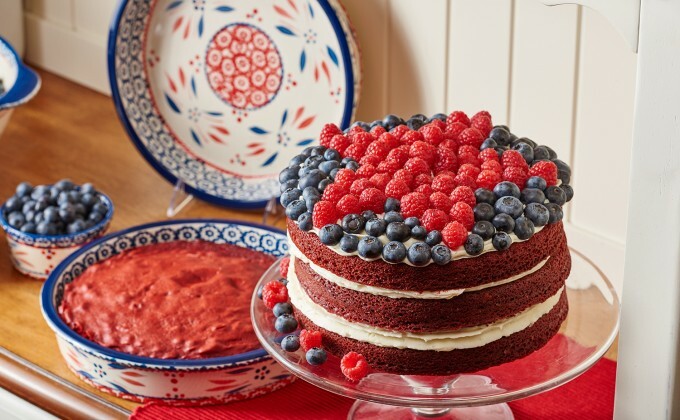 Pour half into each of your temp-tations® 9-inch round cake pans. Bake for 30 minutes or until a toothpick inserted into the center comes out clean. Cool completely. Invert cake layers onto a cutting board. Cut each layer in half horizontally. You will have 4 layers total. Place one layer on a cake plate. Top with 1/4 of the frosting. Place a second layer on top and spread with another 1/4 of the frosting. Continue layering until all 4 layers are stacked. Spread the remaining frosting on top. Lay the raspberries on the top to form a giant star. The points of the star should come out all the way to the top edge of the cake. Cover the frosting around the outside of the star with blueberries.